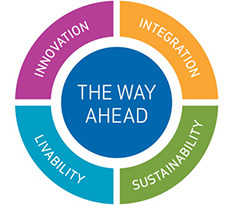 Four principles underpin the development and implementation of The Way Ahead: integration, sustainability, livability and innovation. A planning approach and operational culture within a municipality that encourages and enables continuous improvement and the exploration and adoption of new techniques, technologies, products and ways of operating in order to improve results and lead progressive change. A holistic view of strategic planning that acknowledges the interrelated and interdependent reality of complex urban environments. Goals and priorities for different elements in urban planning reflect interrelated ecosystems and are considered in terms of how they impact, support and drive each other. A set of interrelated factors that influence people in choosing where they live and reinforce their sense of well-being. Welcoming place: Residents are active and engaged in urban life. People feel safe, connected and alive in a vibrant urban centre that values its people, places and activities. Public spaces: Public spaces are generous, magnetic, transformative and alive with activity. Diversity: Parks, recreation, arts and cultural events meet the rich diversity of citizens, the result of productive partnerships between residents and the city in creating projects and programs. Amenities: A clean and well-designed community that supports a range of lifestyle choice, includes open and green spaces, respect for historic elements and fosters a sense of pride in place. Economic prosperity: Sustainable economic employment and lifelong learning opportunities that build on the skills and contributions of its diverse local and global workforce. Access & Affordability: The ability of people of all incomes to have access to affordable housing, food, transit and core social services. The recognition as well that the affordability of amenities affects the overall competitiveness of the city in attracting and retaining residents. Safety: A sense of personal and community safety and overall social order. Caring: Communities that reach out to include all of their citizens in community life to help each individual have the optimum opportunity to reach their potential. Community capacity: Needs of low income, vulnerable, and at-risk residents are met by building individual and community capacity so that all residents are better able to address current and future issues and chart their own future course. Environment: An environment that is sustainable for current and future generations through responsible social, fiscal and environmental practices. Clean air and water, access to local food supply and the healthy coexistence of natural and urban environments. Participation: Political and democratic processes that provide for public participation in the decisions that affect residents and ongoing transparency of local government. A way of living that meets the needs of the present and does not compromise the ability of future generations to meet their own needs. Urban planning takes an integrated, holistic view of urban environments and defines sustainability in the context of interrelated ecosystems encompassing economic, social, environmental and cultural sustainability. The principle of sustainability includes financial sustainability; ensuring urban planning recognizes and addresses resource constraints and capacities. City of Edmonton Strategic Plan: 2009-2018 (updated in 2014).